Noam Chomsky’s political views attract so much attention that it’s easy to forget he’s a scientist, one of the most influential who ever lived. 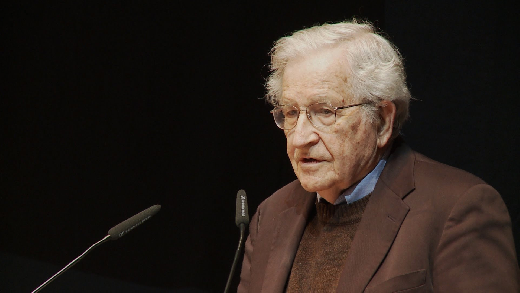 Beginning in the 1950s, Chomsky contended that all humans possess an innate capacity for language, activated in infancy by minimal environmental stimuli. He has elaborated and revised his theory of language acquisition ever since. It’s a great article, and includes an interview with another accomplished linguist, Steven Pinker. Pinker concludes that even after decades of brutal examination and criticism, Chomsky’s famous thesis best explains how children master language. The alternatives boil down to arguing that language is an artificial construct of the rational mind that children, starting from a blank slate, must learn. This vindication of Chomsky’s universal grammar theory is interesting on two counts, and both impact my writing. First, I’m fascinated by language. More important, scientific support of language as an inborn capability bolsters the view that people are naturally social, as opposed to the atomistic, rationalistic view of humanity pushed by both Hobbesians and Marxists. We’re not plopped on this planet to enrich ourselves and consume; we are born to experience the world and find ourselves in it. That’s the worldview that animates everything I write. Mike, I enjoyed the post but could you explain your title for me? I need help comprehending the piñata reference. Let this comment be my way of giving you a whack so that enlightening words can spill forth. Ha! Always good to hear from you, and thanks for reading! I find your world view refreshing and spot on, Mike.